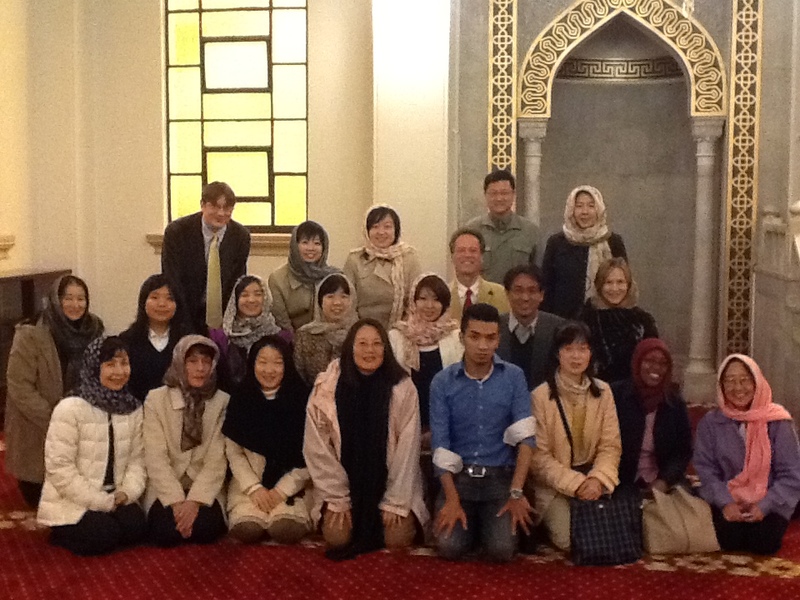 The Kansai Chapter of SIETAR spent the day (April 20, 2013) learning about Islam, not by sitting in a classroom reading about Islam, or by watching a DVD, or even by inviting a guest lecturer, but by actually travelling to Kobe and visiting the Kobe Muslim Mosque, the oldest mosque in Japan. About 20 members (with a few visiting non-members) participated in this hands-on experience. It was the first time for many of us (myself included) to actually enter a mosque—and it was both a spiritually and sensually fulfilling experience. The Kobe Moslem Mosque, founded in 1935, is a magnificent piece of architecture, from the outside dome and minarets to the inside atmosphere of quiet elegance and peaceful silence. All of the women in our group covered their heads with scarves before entering, and all of us took off our shoes in the entryway before stepping into the prayer hall, a large room with a high, domed ceiling, and a mihrab, or ornamental indentation in the wall which marks the qiblah, the direction that worshippers face, towards Mecca. Above the mihrab were two phrases beautifully written in Arabic: “La ilaha illa Allah, Muhammadur rasoolu Allah”—“There is no true god but Allah, and Muhammad is the Messenger of God.” Although the mosque is built mainly of stone, the feeling in the prayer hall was warm and welcoming. A thick deep-red carpet covered the floor and there was almost no furniture. Our group was swallowed up in the large space and I’m sure all of us felt the spiritual aura of this holy place. Mr. Arai Ahsan, the General Secretary of the Kobe Muslim Mosque, talked to us about Islam in general and about prayer services at the Kobe Mosque in particular. Mr. Arai pointed out that the words above the mihrab are the Testimony of Faith, which is the first and most important of the five pillars of Islam. The other four are: Prayer, which must be performed five times every day, Giving Zakat, a portion of one’s income to support the needy, Fasting during the month of Ramadan, and Hajj, making the pilgrimage to Makkah (Mecca) at least once in one’s lifetime. He pointed out that it is important for Muslims to pray together at least once a week, so people gather from all around the Kansai area as often as they can. For example, the prayer times for the day our group visited the mosque (April 20) were 3:52, 11:59, 15:40, 18:35, and 20:00. Mr. Arai talked to our group in the early afternoon between Dhuhr (second time of prayer) and Asr (third time of prayer). We learned that Islam is not a new religion dating only from the time of Muhammad, but a very old religion with roots going back to Adam and Eve through Abraham and on to Muhammad. Our group of interculturalists asked many questions and there was a general feeling of reverence mixed with scholarly inquiry. We found out that women do not pray in the ground floor area of the prayer hall, but have a separate upstairs area opposite the mihrab from which they can see the prayer hall and join in the prayers. We also learned about the roots of the Sunni-Shia split in Islam. Sunnis trace their beginnings to Abu Bakr, the father of Muhammad’s wife Aisha, whereas Shias believe that Ali, the husband of Muhammad’s daughter, Fatimah, is the rightful heir to the teachings of Muhammad. We later learned (at Nishimura Coffee, a beautiful old three-story café with comfortable chairs, high ceilings, and a great ambiance) from Mr. Mustafa, an Afghanistan senior student at Momoyama Gakuin University, who is a Shia, that Sunnis are by far in the majority (about 85%) and have more power, but that Shias think of themselves as more directly linked to Muhammad. As an interculturalist, I felt that Mr. Arai (Sunni) and Mr. Mustafa (Shia) might learn a lot from each other, maybe with the help of a peaceful intervention by a SIETAR member. After our visit to the Kobe Muslim Mosque and our coffee and tea break at Nishimura Coffee, the group headed to Kobe Grocers, whose shelves are stocked with lots of American, European, Indian, and other foreign foods (I bought a bag of miniature Butterfingers) as well as a large supply of halal food for Muslims. After that we ended our field trip with dinner together at Café Istanbul, a very authentic Turkish restaurant, whose really friendly Turkish chef not only served us excellent food, but also helped create a warm and welcoming atmosphere. A belly dancer (Yayoi Nakanishi Lana) and live musicians provided excellent entertainment, and most of the group ended up dancing along with the belly dancer and some of the other patrons of Café Istanbul. A great time was had by all, and it was the perfect ending to a perfect day! There will be an informal dinner gathering afterwards. Please let us know if you would like to join it when you come to the presentation. The Philippine Uchinānchu Nisei comprises a significant group of individuals living and working in Okinawa. Born of Okinawan mothers and Filipino fathers who once worked on U.S. military bases during the immediate post-war years, these Nisei, I argue, are an “invisible minority” within the context of contemporary Okinawan society, as well as within the constitutive category of “Japanese” that tends to conflate nationality and ethnicity (and race) thus creating boundaries defining exclusion and inclusion within the nation-state. Many of these Nisei work on military installations that dot the main island of the prefecture. Most of them hold Japanese citizenship and thus, Japanese names, making them “Japanese” by law and by virtue of parentage. While living as “Japanese” in legal terms, they see and call themselves as “half”: “half-Okinawan” and “half-Filipino”, where emphasis on “half-Okinawan” vis-à-vis “half-Japanese” indicates a claim or an assertion of one’s Okinawan identity. This claim, as well as the recognition of themselves as “half”, and thus “mixed”, is tied to notions of ethnicity, race, and nationality, which are interdependent and interconnected, and in many cases, considered to be one and the same. For this study, I explore how ethnicity, race, and nationality intersect using the case of the Nisei and how these intersections enable the creation of an invisible minority within the category of Japanese nationals. With this, I discuss how “Japanese” and “half” are both ascribed and self-ascribed identities, and how each of these two categories delineate “boundaries” and hence engage in “boundary making process/es”. Johanna Zulueta is currently a post-doctoral research fellow of the Japan Society for the Promotion of Science and is currently based at Hitotsubashi University’s Transnational Sociology Program. She graduated from Hitotsubashi University with a Doctor of Social Sciences degree in March 2011. She is a sociologist by training and her work focuses on migration and ethnic studies, particularly on contemporary migrations between Okinawa and the Philippines. She has also served as Lecturer of Sociology and Japanese Studies at the Ateneo de Manila University in the Philippines.